Syria's Kurdish Democratic Union Party (PYD) is ready to put forward proposals for constitutional referendum discussions at intra-Syrian talks set to be held in Kazakhstan this month if invited to do so, the PYD's co-chairman told Sputnik on Tuesday. 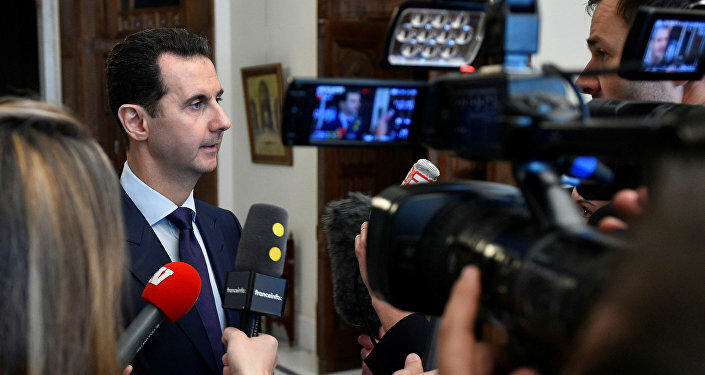 MOSCOW (Sputnik) — In an interview with French media on Sunday, Syrian President Bashar Assad said Damascus is open to constitutional referendum talks at intra-Syrian negotiations in Astana. "We have a blueprint of social contract. The changes to the constitution should consider it," Saleh Muslim said adding that "the Political Document for the Future of Syria" was adopted by the Constituent Assembly of the Democratic Federalism of Northern Syria on December 29. He said that Kurdish engagement in intra-Syrian talks was important for settling the country's civil war, adding that "the Syrian Democratic Council (SDC) [which is a political wing of the Syrian Democratic Forces led by the PYD] is not invited yet to Astana." "The constituent assembly of the democratic federalism in northern Syria sees that the Syrian crisis can be solved through rebuilding the republic based on a democratic constitution. We have sought to hold a dialogue with all Syrian political parties to solve our problems and decide our future. However, we have been marginalized and excluded from all the meetings that have taken place so far," Muslim said. The Syrian peace talks in Kazakhstan's capital Astana which are likely to start in late January follow a UN Security Council Russian-Turkish-backed resolution on a ceasefire. A nationwide ceasefire between Syrian government troops and several opposition factions has already come into force. Turkey has insisted that the PYD should not take part in the Astana talks. Turkey believes the PYD has links to the pro-independence Kurdistan Workers' Party (PKK), active in southeastern Turkey and listed a terrorist organization by Ankara.